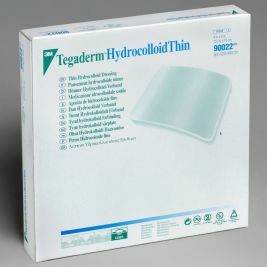 Hydrocolloid dressings are used for low to moderately exuding wounds. They can be used for a variety of purposes, including treating pressure sores. 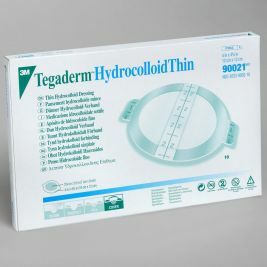 Biodegradable and non-breathable, hydrocolloid dressings adhere to the skin and require no additional taping. The surface of the dressing is coated with a cross-linked adhesive substance, which contains gelatine, pectin and carboxy-methylcellulose along with other polymers and adhesives. Meanwhile, polysaccharides and other polymers on the surface of the dressing absorb water and swell to form a gel. Moist conditions created by the dressing help with the healing process during wound care, and promote fibrinolysis and angiogenesis. Using hydrocolloid dressings can improve exudate wound management and keep patients safe from infections and other complications. 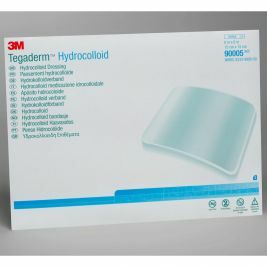 At Care Shop, we offer a range of reliable hydrocolloid dressings from trusted brands, including 3M Tegaderm thin dressings. Our hydrocolloid dressings are available in oval and square shapes, with a variety of sizes available to suit different wounds. Each dressing is sterile wrapped in easy-to-open packs for maximum safety. 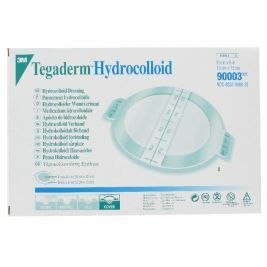 Browse our selection of hydrocolloid dressings below, or stock up on everything you need from our range of wound care supplies. Hydrocolloid Dressings There are 4 products.